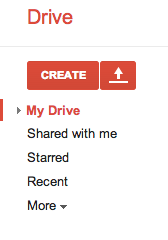 1) Make sure you are in MY DRIVE (highlighted in left toolbar). 3) Click on the red CREATE button above the left toolbar. 4) Click on Untitled document in the top left hand corner, to rename the document. 5) Give the document a title. 1) Open the document you need to copy. 2) At the top click on FILE and go down to MAKE A COPY. 3) Re-name your document using a new title. This will now appear in My Drive (your own documents). 1) In the top right corner of your open document, click on the blue SHARE button. 2) Type the name of the person in the line provided. 3) Select the rights you wish the person to have (Can View, Can Comment, Can Edit). 4) Click SHARE and SAVE and then DONE.